With the location management system “Mobaroke” and the Internet, you can always know where a vehicle is. Since the Professional IP Radio System “Voice Packet Transceiver” uses the mobile telephone network, you can communicate all across the country. Transportation efficiency is improved because you can see accurate location and movement of vehicles. Customers are very satisfied with this system. 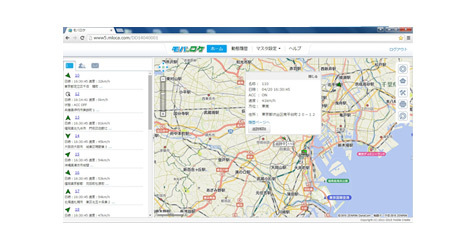 The location management system “Mobaroke” uses the Professional IP Radio System “Voice Packet Transceiver” to get location through GPS, and forward the information to Mobile Create’s server via the mobile telephone network. 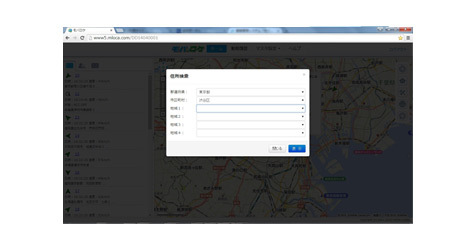 Access the server using a PC, iPad or smartphone, and see the location of vehicles and workers on the screen’s map. This system displays vehicle location and speed on a map, and makes driving conditions visible. It makes for more effective vehicle operation and cuts costs. It can also improve safety by monitoring speed. 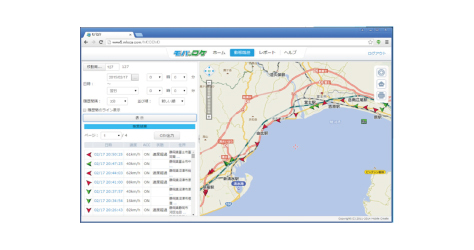 Professional IP Radio System “Voice Packet Transceiver” has a high-precision GPS receiver. Compared to existing systems, it sends information in short intervals. Location information can be checked via smartphones, cellphones and PCs. Since at Mobile Create we develop all the hardware and manage the cloud server ourselves, we can offer surprisingly low prices for both initial and running costs. I want to see the locations of all the vehicles in detail. You can see all the vehicles on the map. The locations, directions and speeds of all vehicles are displayed on the map, and you can see the movement of trucks and taxis in one view. I want to guide drivers based on past data. The driving history of vehicles are displayed in 3-minute intervals. 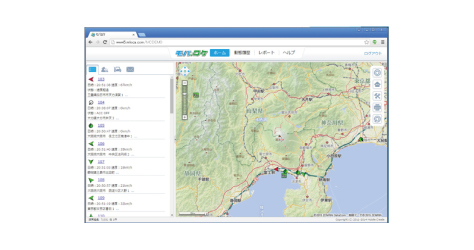 The history can be used when selecting driving routes and for proof of delivery to customers. Also, by watching the speed of vehicles, you can give safety guidance to drivers and ensure reliability to clients. I want to track the location of a specific vehicle in real time. This is a convenient way to track the route of a vehicle in real time. The vehicle being tracked is always shown in the center of the map so that it is never lost by going off the screen. I want to contact nearby vehicles. This function can send a text message to an IP radio. It is also possible to send a message to more than one vehicle at once. Receiving messages are displayed on the multi-function microphone and are accompanied by a sound alert. This is useful when a driver can’t talk or the message is not so important. I want to know the address of new customers and tell the driver. This function lets you search and display the location of an address on the map. 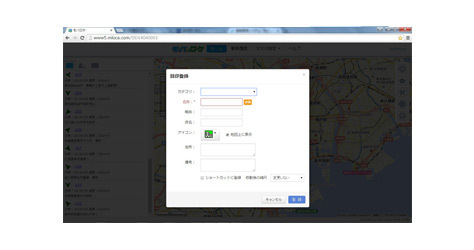 Just enter the address in the input screen. When drivers don’t know how to get the destination, the dispatch center can send them a route. I want to know how long it will take when there is more than one destination. This function lets you find and display a route to multiple points. 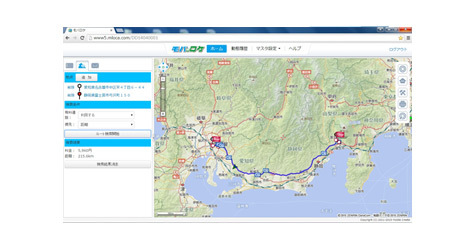 It is great for finding the shortest routes for shipping. I want to find a client’s address more easily. You can register places such as train stations and clients’ offices as landmarks. These destinations can be displayed on the map quickly by searching the landmarks. It is easy to find the closest vehicle when you get an urgent pickup request from a client, because you can search for the landmark quickly. It would be great if I could automatically make daily driving reports. As an optional service, you can add “daily driving reports” to strengthen your management system. This service creates daily reports including the mobile station’s speed, etc. Have you ever had trouble knowing the location of a truck because you can’t contact the driver? Now you can see if your shipment is on schedule through the screen without even asking the driver. Manage everything from collection to disposal. The history of each vehicle will be kept on the server. You can manage details such as dates, times, and routes. 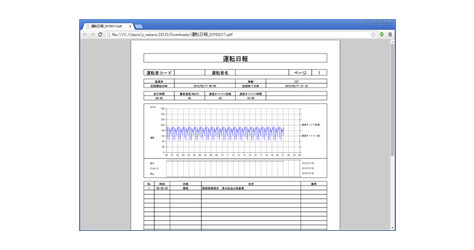 Gain trust from your clients by using the tracking system for industrial waste. Transport concrete to sites within a limited time. Ready-mixed concrete should be transported quickly! You can calculate whether it can be transported on time, knowing the accurate location of the vehicle. In the event of an accident, an alternate vehicle can be sent quickly by seeing the current location of all other vehicles. Be prepared even in the event of an accident. “Mobaroke” works even when drivers can’t provide their location using audio such as in a traffic accident or bus hijacking. Location information is sent to the system every 100 meters (or every 3 minutes when parked), so the manager can view the accurate location of the vehicle on the map. Since the MPT-H1 Portable type has GPS and is water and dust proof, it is useful in areas where vehicles cannot enter. 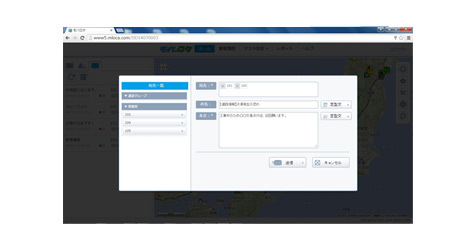 Because the head office can see the location of people who are in the rescue mission, it is possible to check whether or not they are involved in the accident. Since the MPT-H1 Portable type has GPS, you can see the location of the vehicle going to an emergency scene. It can be used to call when the guard arrives at the site. Of course, you can talk while walking around the site as well as the MPT-H1 Portable type can also be used outside of the vehicle. What kinds of industries have been using “Mobaroke”? “Mobaroke” has been used in various industries such as transportation, industrial waste disposal services, newspaper, ready-mixed concrete businesses, governments, etc. Do we need any special devices to use “Mobaroke”? No. You only need to connect the GPS antenna to get the location. The GPS antenna is sold separately. What kind of vehicle information can we get from a PC in the office? You can get information such as on/off status of engine, speed, unloading, having a break, etc. Can we see the speed of the vehicle? Yes. You can also change the color of the icon of the vehicle when it is driving faster than the set speed. How can we know the location of vehicles? The radio system gets the location from a GPS receiver and sends the information to the server via the mobile telephone network after a specified time or distance travelled.